What Can Competitions, Certifications & Badges Mean for Students? Every day changes are made to the tools people use to solve problems and collaborate with others. These evolutions coupled with an increasing pace of change has shifted how and when we assess student learning and provide student feedback. No longer does a single test score or degree defines someone’s competency. The ability to clearly communicate, fail quickly, and work on a team continue to be important, regardless of the industry or career. Universities and employers are looking for individuals to demonstrate and provide evidence of their knowledge in innovative and relevant ways. Developing a growth mindset, practicing entrepreneurial thinking, and maintaining a portfolio of accomplishments and skills is more essential now than ever. Keeping up with dramatic change requires a growth mindset. Gone are the days of assuming that individuals are limited by a certain set of capabilities. Instead, effective teachers support students to apply a growth mindset to learning new and difficult material. Maintaining a growth mindset requires a commitment to learning new skills, trying new things, and metacognition. As problem solvers who explore unanswered challenges, successful entrepreneurs naturally apply a growth mindset to their work. One of the best traits students can leave high school with is a passion for learning new things. No matter what field they choose to pursue, they will be equipped with the skill to evolve and adjust. Entrepreneurs are connected learners. They develop a skill set to connect what they’re learning and apply it in the real world. They’re comfortable dealing with ambiguity. Entrepreneurs don’t have all of the answers, and they’re okay with that. Entrepreneurs embrace optimism. These individuals see an opportunity when others see a problem. They’re constantly absorbing new information — and they take the time to learn more. They understand where their strengths are and how to work with others — to drive their results or solve the problem they’re working on. Unlike content based skills like coding, working in a spreadsheet, or editing a video, mindsets cannot be measured from a standardized test. There is no badge for showing resilience, but you can earn one for understanding the basics of Python. There is no certificate for demonstrating optimism, but there is a certificate for mastering project management. Yet, these soft skills and mindsets are critical. 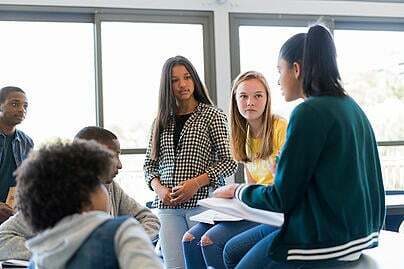 One way that high school students can display their skills, as well as their growth and entrepreneurial mindsets, is through business competitions. These competitions, ranging from marketing research to entrepreneurship (think Shark Tank), offers students the opportunity to showcase their mastery of skills that the computer-based tests are not yet able to assess. Students who participate in these competitions create videos before or during the event that become a formal artifact of their communication, presentation, and teamwork skills. Often, a business pitch includes a story of the grit and learning from failure required to get to a competition. And if they win, many students walk away with scholarships or investment money, on top of certificates of completion or participation. More common industry certificates, like those offered through Certiport, help employers and universities assess student understanding of specific tools and platforms. These standardized certificates become the base of the student’s professional portfolio regardless of their future field. Since certificates do not last forever, they require continuous learning and application. In contrast, badges are less formal and are more about incentivizing continued learning than about assessing skills. From Pokemon Go and Apple Teacher to Lyft it seems like everyone is providing badges. Normally based on achieving milestones, badges are a way to verify completion of an activity or event. Ultimately, videos from competitions, certificates, and badges are all important artifacts for students to display mastery and continued learning of content knowledge and skills. More and more, social and emotional skills are playing a larger role in today’s economy — and as more jobs are replaced by automation, it’s expected to grow in coming years. A recent Deloitte Access Economics study forecasts that soft skill-intensive occupations will account for two-thirds of all roles by 2030, compared to half of all jobs in 2000. As students seek ways to showcase these skills, participating in competitions or weekend hackathons become portfolio pieces for careers that do not yet exist. Demonstrating innovative thinking and social-emotional competency by actually creating real things is one of the best ways for students to stand from the crowd. The tools we use to support continual learning and the skills valued by the future have changed, Now it’s time to evolve how we prepare and assess students. Find ways to move beyond single test scores to include a portfolio of artifacts, certificates, and badges. When schools empower students to have authentic learning experiences and to do more than prepare for tests, students are able to develop a broader range of skills that equip them for the unknown yet exciting future.